I wanted to introduce you, in time for Fathers' Day (or for your own wear), to a terrific boutique that carries jaunty Breton sailors' shirts, if you don't know about them already. 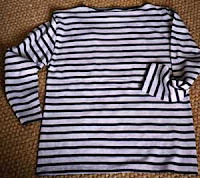 The Breton shirt, officially created by the 27th March 1858 Act, introduced this blue-and-white striped knit shirt in the uniform list of the French seaman. The stripe allowed a man fallen into the sea to be located more easily. Unlike LL Bean, who make serviceable but less substantial models, this is the real deal, from Brittany Boutique, in a wide range of sizes and styles. Le Duc has a half-dozen, ranging from the traditional navy/white to offbeat combinations like khaki/orange, fuscia/pink, or burgundy/theatre curtain red. Hipper than a sweatshirt, hardy and flattering, the older they get, the better they look. Brittany Boutique carry various styles and brands for men, women and tiny sailors, as well as other maritime items. The mens' models are unisex, order a size down for women. But the one you want for your captain is the Meridien genuine traditional Breton Sailor Shirt, in heavy cotton knit. I especially like the hand of this fabric: not a fleece, thicker than a polo shirt, with a rather dry finish. You just don't find utilitarian but high-quality fabric like this anymore. Price, about $52 US per shirt. You don't have to be a sailor! Perfect for buzzing around town, cycling, walking the dog or a casual dinner out. Prompt, precise service from the site, shipping world-wide, and friendly communication, in English if you choose. What a find! I've bookmarked this site, thanks Duchesse! It's always so great to know where to find The REAL Thing ... . I am so excited about this post! I have been looking at these shirts for a long time but cannot figure out which would be the best to start with. This would be for me, my DH wouldn't go for these. So, if you or anyone out there has any reviews on the light weight or heavier weight striped shirt please pass them on. And sizing. Do they run big? Wide? Dear Duchesse thank you again for this post and forgive me my overzealous queries. I've long had a soft spot for these shirts. You should post a picture of Le Duc sporting one of these! Anonymous: Your inquiries are best answered by the vendor, who knows his products and is very friendly: chal@wandoo.fr. I only buy the Meridien traditional shirt.